Proposed Rendering of 1010 Park Avenue, Manhattan. Image Credit: LPC. Park Avenue Christian Church, which would demolish annex for mixed-use development in partnership with Extell, claimed finding was necessary to maintain historic church fabric and its religious mission. 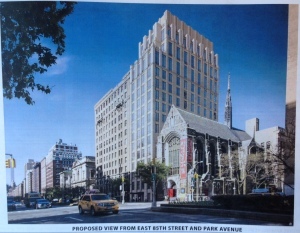 On October 21, 2014, the Landmarks Preservation Commission held a hearing on a proposal for the demolition of an existing church annex and the construction of a new 15-story building on property belonging to and adjacent to the Park Avenue Christian Church at 1010 Park Avenue in Manhattan. The property lies in the Park Avenue Historic District, designated in 2014. To the south of the annex stands a 13-story apartment building completed in 1916 to designs by architect Emery Roth, an architect renowned for his hotels and apartment buildings. 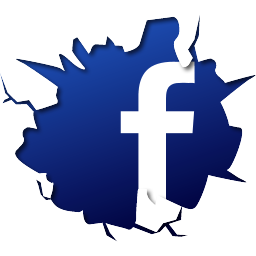 The development would be done in conjunction with Extell. At a hearing on the district’s potential designation, Church representatives informed Landmarks of the development, and testified to the annex’s lack of historic or architectural significance, and petitioned Landmarks not to thwart a project important to the Church’s financial stability. An annex including a rectory was built with the 1911 Gothic Revival church, but later demolished and replaced with the existing annex in 1963. The current annex is listed as “no style” in Landmark’s designation report, but does retain a piece of the original 1911 rectory facade. Kramer Levin attorney Paul Selver said the development, which would house market-rate residential uses, as well as space for church use, would give the church the “resources it desperately needs” to maintain, restore, and preserve its main sanctuary. Selver said the planned new structure would “reprise the fabric of the historic district.” He urged the Commission to consider the application in light of broader public policy issues surrounding religious associations, and cautioned that the City could lose an important institution if development were not allowed. Church pastor Alvin Jackson said he did not represent an exceptionally large or wealthy congregation, and the church struggled to balance its mission with maintaining its building. He said the church required two million dollars for immediate repairs, and an additional three or four million to completely restore and preserve. He said money from the development would go towards an endowment for the church’s permanent maintenance. Architect John Beyer, of the firm Beyer Blinder Belle, presented the plan for the new development. The building would rise to 13 stories at the streetwall, matching the height of the adjacent Roth building, with two additional, set back stories, and a sizeable rooftop enclosure for mechanical equipment. The building would reach a height of 182 feet, minus the bulkhead. The annex would be demolished in its entirety, so the new building could maintain the block’s masonry streetwall. The 45-foot-wide building would be clad in limestone, which Beyer said would make for “neutral background” that would not distract from nearby historic architecture. He said the building would clearly read as contemporary, with a vertical emphasis and larger windows than commonly found in the district. Pilasters would cast shadows and add depth to the facade. He characterized the building’s entrance as “modest,” that would retain the street’s rhythm, with minimal glass and band coursing. The north sidewall would be largely visible over the church from 85 Street vantages, so the architects designed to make it “a finished facade,” similar to the one on Park Avenue, rather than a lot line faced with minimal punched-window openings. An eight-foot-wide enclosed “light court” would separate the new tower from the church’s south side facade. It would be faced in limestone with skylights on the top, allowing light into the church’s Tiffany stained-glass windows. In a joint statement read by a representative, Council Member Dan Garodnick and State Senator Liz Krueger said the existing annex “was meant to be integral to the complex as a whole,” and the proposed tower “does not defer in any way to the church.” A representative of Manhattan Community Board 8 recommended disapproval, finding the proposal too tall for a Park Avenue residential building, and that the north sidewall’s design was inappropriate for a secondary elevation. Kelly Carroll of the Historic Districts Council urged Landmarks not to issue any approval without a memorialized preservation plan in place, and further recommended that the height be reduced and greater distance be maintained between the church’s south facade and the new development. The Carnegie Hill Neighbors’ Lo van der Valk requested that Landmarks reconsider its no-style designation of the annex, and said any new proposal for the site should incorporate the intact 1911 historic fabric. Local resident John Hardiman argued that if the church was basing its application on claimed financial necessity, it should file a hardship application so its revenues and expenditures could be publicly examined. Another resident submitted 800 signatures she had collected in opposition to the proposal. Numerous members of the church spoke at the hearing to attest to church’s need for financial stability, the burden of maintaining its historic sanctuary, and of the importance that high costs of maintenance not hinder its religious mission. Rick Bell, from the New York Chapter of the American Institute of Architects, also spoke in favor of the project, saying the existing structure did not contribute to the district, there was a severe need for housing in the City, and the organization supported new architecture in historic districts. Chair Meenakshi Srinivasan said the commission would convene again at a later public meeting for a response to testimony from the applicants and for a discussion among commissioners because the hearing continued past the meeting’s scheduled end time. Srinivasan noted that the designation report had been approved by Landmarks and the City Council, and the Commission would not revisit findings on the annex’s significance. She asked the applicants to address the issues of heights and scale, the demolition of the original remnant, and the access of light from the south, among other issues raised by testimony. Srinivasan left the record open for two weeks for the submission of written testimony. LPC: 1010 Park Avenue, Manhattan (16-1604) (Oct. 21, 2014) (Architects: Beyer Blinder Belle).